CREATIVE PLAYTIM: Assist your little one to match the different buttons to the pegboard of different themes picture to create a first world impression, and learn about colors and shape by his little hand eye. 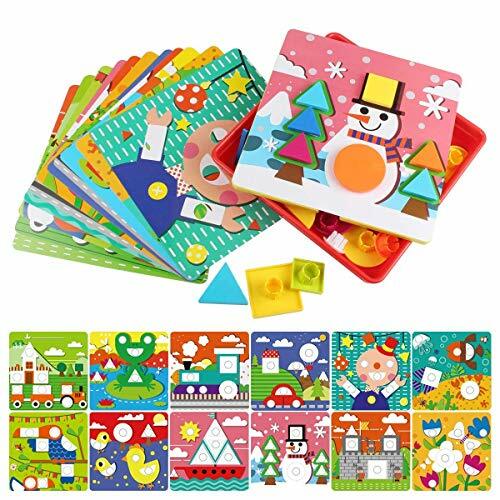 PUZZLE GAME: The toy with varied colorful picture include frog, fish, train, etc as well as multi shape button, all perfect for little ones to do sorting, counting and coloring, and stimulate the brain's imagination! CHILD-FRIENDLY: The size of the button is moderate, which is convenient for the baby's grip, and there is no need to worry about eating it (cannot swallow). Therefore, it is suitable for babies over one and a half years old. EASY CLEAN UP: A storage tray is includes to makes it easy to store or collection all the buttons and pictures at the end of the game, so you don't have to worry about it being scattered around. WHAT'S IN THE BOX: Each box include 12 different cartoon theme picture and 26 colorful & various shapes button, a pegboard and a storage box. The 5-6 month old baby began to have the idea of exploring the world. and also use small eyes to spy on the color of the world.